11 horses have been entered for the Grade 2 Charlie Hall Chase at Wetherby this Saturday in what is the feature race of the day at the track and amongst the entries is last years winner Bristol De Mai who is making his seasonal return in the same race he did last year. 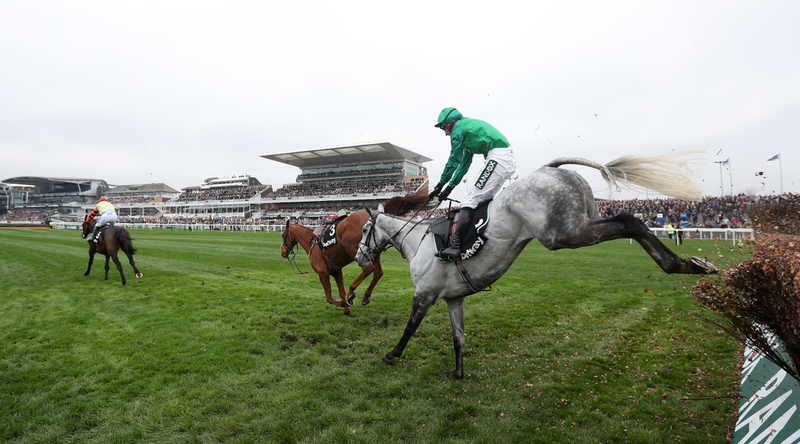 This race is seen as the first major chasing race of the jumps season and last year Bristol De Mai managed to fend off a strong challenge from his stablemate Blaklion to go on and take the glory for the Nigel Twiston-Davies camp. From there the grey backed that victory up with an outstanding performance in the Betfair Chase at Haydock beating his rivals by a substantial 57 lengths. Since then he couldn't manage to pick up another victory when shipped into better company in racing and had a wind operation. This year he faces some really stern opposition with the returning superstar that is Thistlecrack for trainer Colin Tizzard. His last victory came on Boxing Day 2016 when he won the King George VI Chase at Kempton in emphatic style against his stablemate Cue Card. Before that he was running over hurdles but was never running like the same horse after picking up a serious injury in training that really halted his career. Hopefully after having no issues and really good summer to prepare for the upcoming endeavour he will be back to his best. The Paul Nicholls camp who is absolutely flying just in time for the start of the season has two runners that are set to go to post. Black Corton who was a triumphant horse last year being a real fighter for his jockey Bryony Frost and really made her name in racing and Clan Des Obeaux who looks to be a real smart type for the yard if he can live up to his potential from last season. Other entires, that are sure to be finalised over the coming days, come from Gordon Elliott who could pose a three pronged attack in the race with Outlander, Don Poli and Alpha Des Obeaux all set to head to post. Brian Ellison’s Gold Cup sixth Definitly Red, Anthony Honeyball’s Regal Encore and Double Shuffle for trainer Tom George complete the line up for the Grade 2. Clerk of the course Jonjo Sanderson is pleased with the entries but would like to see a bit more rain in the forecast to really make the occasion a spectacle for everyone to remember. (Credit At The Races) The Clerk said:“I’ve been up at Redcar this morning, and they got 28 millimetres of rain this weekend – while Wetherby only got eight. “We’re good ground at the minute – and we certainly won’t let it get any quicker than that, so we’ll be watering to maintain. “There’s not much rain forecast – and while I know trainers would rather have natural good ground than watered good ground, we’ll get the best ground we can have for Friday and Saturday. “As ever at this stage, the Charlie Hall looks a cracker, but we’ll just have to see who is declared and who turns up – because last year Double Shuffle was declared, and didn’t make it to the track because of travel problems!